What do you see when a classically trained African American fine artist from LA decides to mash up Jewish Eastern European folk art with portraits of passionate Israeli hip-hop men of color? 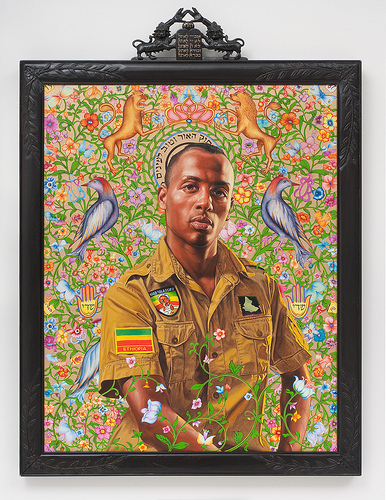 Find out at the most recent installment of Kehinde Wiley’s series, The World Stage, which will soon end its run at The Jewish Museum. It’s the Israel portion of Wiley’s effort to “chart the presence of black and brown people around the world.” It’s a stunner partly because of the paintings, the models, the provocative country choice, the Museum, and the physical Fifth Avenue setting. Traveling to Tel Aviv during 2011, Wiley wanted to see, meet, and document men of color in a country that he really only associated with an anxious source of conflict. When he scoured the discos, malls, and promenades, he found that hip-hop practitioners and fans associated regardless of their identity as Ethiopian Jews, Arab Israelis, and other native-born Jews. That’s who you’ll meet on the walls and in the video. If you’ve seen Wiley’s other work, you know that he smothers his canvases and subjects in pattern. In this case, inspired by the collection at the Jewish Museum, you’ll have the treat of actually viewing patterned 19th-cetury textiles and Eastern European paper cuts from the collection that inspired him. Plus, you can enjoy the echo between the curlicues on canvas and on the wood paneling of the (former) Felix Warburg mansion. Best gift items associated with a current exhibition: Wiley’s skateboard deck and dog tags featuring his proud subjects.